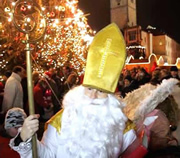 Mikulas, St. Nicholas Day, is on the 5th December and marks the start of Christmas for Czech people. Head for the Old Town Square late afternoon to observe the traditional events unfold - Mikulas photos. Around 4pm on the 5th December, three figures slowly move around the Old Town Square, in and out of the Christmas markets. They are St. Nicholas, an Angel and a Devil. Surrounding them are a throng of small children, gazing in awe, but with some apprehension. Their parents meanwhile look on with masked grins. Glance around the square and there are several such groupings, for today is Mikulas. Czech children raised on stories of Mikulas know precisely what to expect. St. Nicholas will ask each and everyone of them if they have been a good child during the past year. Most children naturally say yes and will be asked to sing a song or recite a short poem, after which they are rewarded with a small present or a sweet. But if St. Nicholas suspects they have been naughty, well! Naughty children don't get sweets, they get lumps of coal or hard potatoes. And if they have been really naughty, they will find themselves in the Devil's sack and sent to hell! With this in mind, small children are understandably worried by the presence of the Devil. So when St. Nicholas and his entourage approach, the children sing their song or recite their poem with great gusto. Needless to say, Mikulas acts as a strong incentive to be good throughout the year! 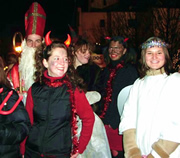 The tradition of Mikulas is thought to derive from a 4th century Christian saint, Nikolaos of Myra, who, it is said, secretly gave gifts to people. On the day of Mikulas, the Christmas markets are in full swing. Buy a hot drink from one of the stalls, perhaps some food, and observe this wonderful tradition unfold.